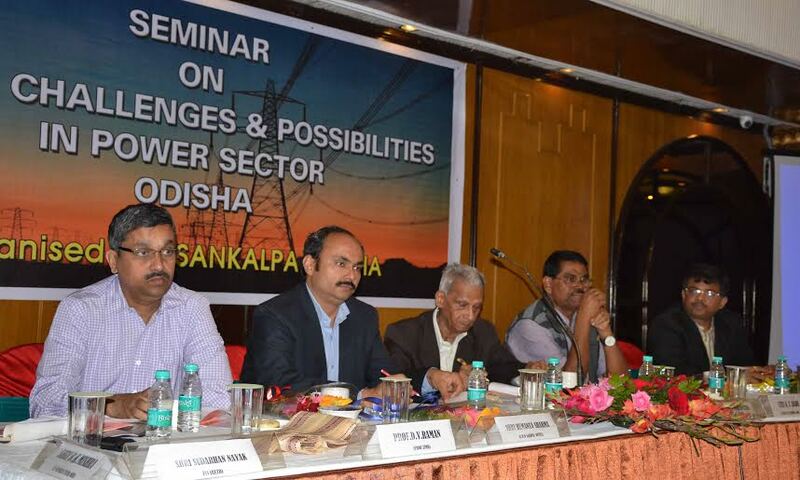 Sankalpa Odisha, a group of intellectuals, has organized a seminar on issues, challenges and Possibilities in Power sector, Odisha at Hotel Swosti on Friday. Addressing a vibrant audience in the seminar Sri Hemanta Sharma, IAS, CMD OPTCL as chief guest highlighted various issues, challenges and possibilities in power sector of Odisha. He further said that though consumer base has been increased significantly during the last 3 years, the real problem we are facing is that the lack of technically skilled manpower. Prof. (Dr.) D.V. Ramana stressed more on electricity regulatory act and legal aspect. He urged that the consumer should well aware of the regulatory Act. Other guest and speakers like Sri K.C. Badu IAS (Retd. ), Sri Manoj Singh, Sri Bibhu Prasad Mohapatra, Sri K.C Mohapatra, Sri B.K. Mishra elaborated on power generation, transmission and distribution part in Power Sector followed by question and answer session. The organisers have unfolded that Sankalpa Odisha is a citizen initiative and shall organise more such seminar and workshops for different sector to draft a vision document for Odisha’s fast paced development. The seminar stressed on harvesting of hydro Power, renewable energy and consumer satisfaction. The Govt. must invest in Transmission and Distribution Sector, Energy Audit, Cluster Development and Electricity Co-operative Societies should be initiated in right earnest. Shri Subas Gantayat from Sankalpa Odisha delivered welcome address and Sri Sudarsan Nayak, IAS (Retd.) gave the key note address.